Ride a horse through the Turkish countryside on a trail ride, and explore a scenic landscape with an experienced guide. 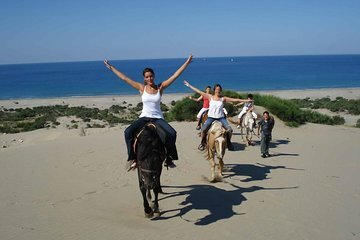 Enjoy from one or two hours of time on horseback, choosing between a route on the beach and a trail through the forest. This riding excursion includes all equipment and round-trip transport from Side hotels, and it’s well suited to both beginning and experienced riders. Morning and afternoon departures are available. Choose the departure time that suits your schedule, then meet a driver at your hotel for transfer to the horse club. Upon arrival at the trail riding base, you’ll get a short briefing that covers the basics of riding safety and technique. Meet your horse for the day, then saddle up and follow the guides on a trail into the countryside. Soak up the peaceful atmosphere of the pine forests, and take a break by a river before turning back towards the horse club. If you select the beach option, make your way towards the water’s edge, where you’ll ride through the sand with views along the coast. After one or two hours on the trail, depending on the option you’ve selected, you’ll arrive back at the starting point and say goodbye to your horse. This horse ride concludes with return transfer to Side, and drop-off at your hotel.